Remember that time you got really frustrated that you had to work so much…and you were exhausted…and realized you should have negotiated more for your salary because who wants to be working all weekend, and all week doing all the things for what little you are paid?!?!? That was you 2 minutes ago? Yes, I know. I hear teachers all the time complain about how they are working too hard. This profession will drag you through the mud if you let it. Now, I don’t mean that your won’t have rewards. With the level of energy you are putting into it, however, and the amount of heart that follows, it’s easy to get into that space. So, this is for you if you can remember a time like above. Let me take you to a recent time I was pouring over my grading. I have a policy that I take 30 minutes of grading home per night. I do this because my daughter is working on her homework at the same time. So I can be home for her, and productive at the same time. What is 30 minutes worth of grading two-three small assignments (quick 1-4 proficiency grading using a generic rubric/scoring system), and one large assignment (like an essay) with one mini assignment (just a check off). So…back to the story…I was pouring over my grading, it was taking longer than I anticipated, so instead of setting it aside, I powered through. It was now 5:30 pm, way past my 30 minute cut off. I had to exercise, get dinner ready and take my daughter to Tae Kwon Do. My eyes welled up. The rest of the evening I was bitter. I was angry at myself and my job. I quickly took on a victim mentality, “Well, if I just had done…” STOP STOP STOP! Cut! End scene! Whatever. I had to be honest with myself. I had to tell myself to stop being a martyr! You are not a victim to your job, nor should you be. Getting a license in teaching does not mean you owe your life to the profession. What it does mean, however, is you need to really need to hold yourself accountable. I am a workaholic by nature. I give everything I do 150,000,000% (hyperbolic speech intended). Guess what happens? I burn out. So, pacing myself is a key ingredient to not going into my martyr brain. My default is to blame either myself or circumstances for this burn out. There is a difference between blaming yourself and holding yourself accountable – one is done out of shame, the other out of empowerment and self love. What does it take to hold yourself accountable without shame? First, accept that you are not a martyr. No one is forcing you to do something you don’t want to do. You love teaching or you wouldn’t be here, even if right now it’s hard to remember why. Whether your administrator changed something last minute and is requiring a formal observation the week before break is irrelevant. You are in the profession, good or bad. Second, appreciate yourself. Remind yourself what gifts you have that brought you into teaching. Your enormous heart is part of what got you into the profession. Third, create self awareness. While your heart got you into teaching, it is also easy to let it be the adrenaline that drives you when you are tired. There are likely signals that you are doing that – physical signals, I get tired and a head ache. Notice these signals and treat them by offering yourself the gift of rest: a 15 minute break, exercise, or some chocolate (an apple if you are feeling healthy). Finally, set your intention for next time. Instead of focusing on what you did wrong, give yourself a focus on what to do next time. Look back on the signal that you felt and what will you do next time? I will not sugar coat it: this job is HARD. So are most public service jobs, ones where you have a responsibility for the betterment of a group of people. So are most JOBS for that matter. That said, you deserve to have the best life! Part of that is taking responsibility for the hardships and working within your power to make it manageable for you. As we start a new year, a time after break, or even just a new week – remind yourself that you are in control of your teaching life. 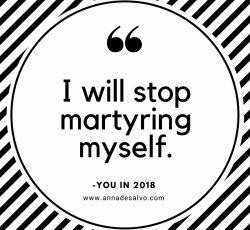 Remind yourself…I will not be a martyr.